Come for the history, stay for the hospitality! SPRING PILGRIMAGE IN SELMA. The very words conjure up images of flowering beauty and historic homes dating back to the early 1800’s. We invite you to come and experience history from the Civil War to Civil Rights as you tour private homes, museums, gardens and much more. You’ll be enchanted with Selma’s special blend of Southern graces and historic places and the largest historic district in Alabama. Tourists from throughout the state, and the world at large, are fascinated with the diverse history and architecture found in Selma, and you will be too. 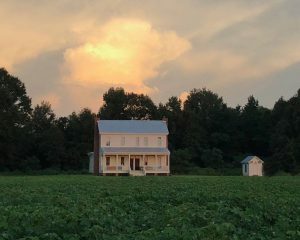 Our Pilgrimage encompasses antebellum houses and industry, Victorian cottages, museums, and a with accompanying stories guaranteed to enthrall visiting pilgrims. Selma was burned in 1865 by Wilson’s Raiders and our surviving antebellum homes are cherished and waiting to be admired and shared during Pilgrimage. Discover why our hospitality is as legendary as our history on March 15 and 16, 2019. Please share to help spread the news. Package tickets are available at eventbrite.com in advance. Packages for $40 may be purchased with cash or credit card at the Vaughan-Smitherman on the days of Pilgrimage or individual tickets may be purchased at each house for $10 or each museum for $5. Selma’s Pilgrimage draws visitors from near and far to experience its diverse history and architecture. Angie Detoro is among those who attends almost every year. She has come to the Selma Pilgrimage for the past 10 years. “I drive from Colorado to Tennessee to pick up my mom and sister, then continue the drive to Alabama. We love the beautiful architectural history of Selma. We appreciate the efforts of the Selma Pilgrimage Committee who make this possible, as well as the countless volunteers we have met over the years and the individuals who so graciously open their lovely homes for the tour. We look forward to attending this year,” she said. Updates are posted on Facebook at “Selma’s Historic Pilgrimage.” You may also email info@selmapilgrimage.com or call 334-412-8550 or 800-45-SELMA (800-457-3562). We suggest you go in numerical order–but you may blaze your own trail–just remember that some homes and museums are only open until 1:00 pm and some homes open at 1:00 pm. 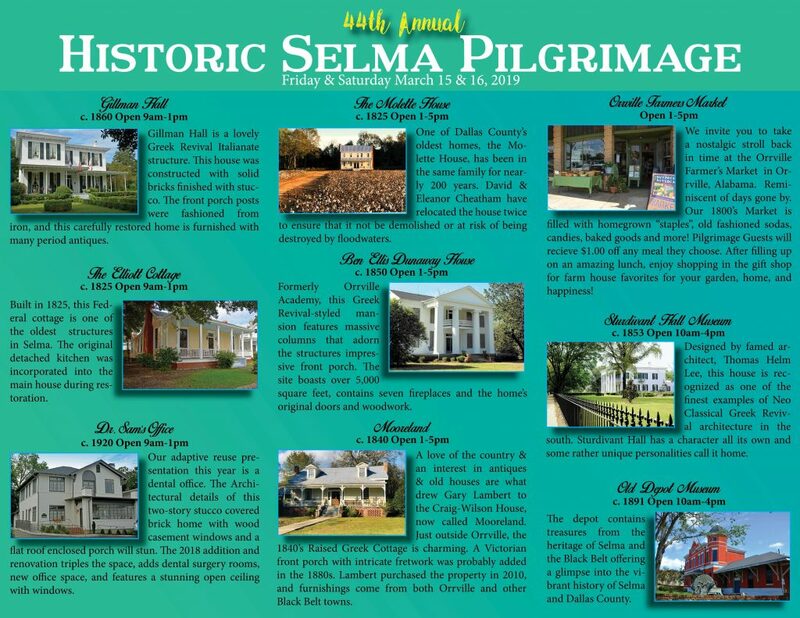 Sponsored by the Selma-Dallas County Historic Preservation Society, Pilgrimage began in 1976 as a way to share the city’s variety of architectural styles and rich history. Selma’s historic district features more than 1200 structures. The 2019 brochure may be viewed by clicking here for the pdf download. A very special thanks to Janet Gresham for her wonderful photography and copy writing on our brochure and this website. Please visit Janet’s blog about Selma. I’d also like to thank Alaina Denean Deshazo for her photographs, Andy Burton for his technical help and the Selma Times Journal for their contributions. If you have questions about Pilgrimage, please print the Selma Pilgrimage Brochure or email us at Info@SelmaPilgrimage.com and someone will get back to you as quickly as possible. Hope to see you at one of the best events in Alabama, Selma’s 43rd Annual Historic Pilgrimage.